While I realise this blog is normally devoted to golf I want to talk about an entirely different sport – football! We Brits tend to think we are passionate about our football but if you have ever been in Morocco you would realise they take their love for the game to another level. If you have ever been there while the national team is playing you can’t help but notice the buzz of excitement on the streets ahead of the game (even just for a friendly) and if they win you certainly know about it, singing in the streets, waving their red and green flags and, rather annoyingly, beeping their car horns till the early hours of the morning. 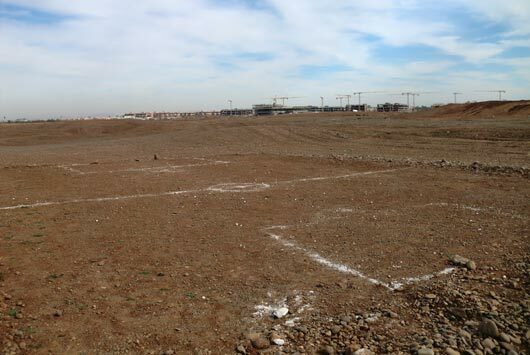 Just as in many other countries football is popular amongst the children who love to play whenever they can, but with few real pitches in Morocco they often have to make use of anywhere they find – including golf course construction sites! Pulling up on the 15th hole during a recent site visit to our project in Marrakech we came across a group of children who had sneaked onto the site and were making use of one of our levelled tees and the chalk we use for marking out to make their own pitch. Thinking they would be in trouble they promptly stopped playing, grabbed their home made ball and scarpered. Now whilst I certainly wouldn’t encourage this kind of behaviour on one of our sites I really couldn’t help but smile at the inventiveness of these kids and the enjoyment they were clearly having before we got there and ruined their game!